It’s got nothing to do with the fact that we love romanticizing Christmas. We don’t really. Sadly, its true meaning gets lost so often behind the frills. 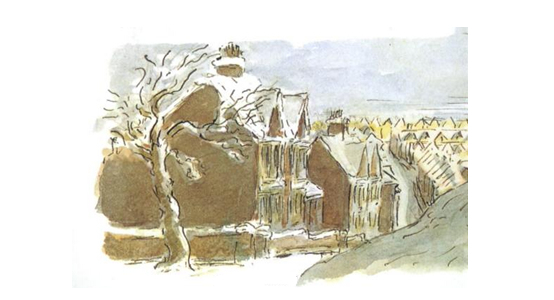 It’s not because the book is based less than five miles from where we are typing this and the cover illustration shows a view of our town we are familiar with, heart-warming though that is. What kind of book is this that even a review inside the front cover can do something to us inside?! It’s been 100 years since Dylan Thomas was born. There have been all manner of celebrations and commemorations on TV, radio, in the locality and across the country. He’s not always easy work and we’ll never forget battling through ‘Fern Hill’ with a Year 6 class not so long ago. Not a good lesson! 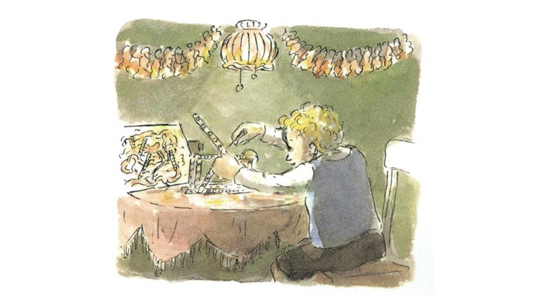 Happily, ‘A Child’s Christmas…’ is more accessible and we’re pretty sure will resonate. Is it because it’s one man’s memory of Christmas childhood and we all can empathize with the wonder of Christmas as a child? Or is it that a poet has a way of touching the heart, even when he/she writes prose? Maybe for you it’s another book, piece of music or poem. One person’s ‘Child’s Christmas’ is another’s Diggy Takes His Pick or The Snowman. And so onto our challenge for your students. 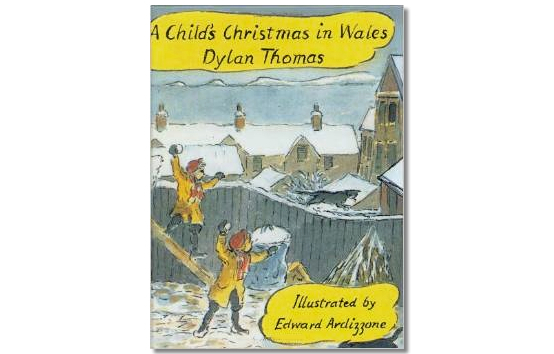 Starting with ‘A Child’s Christmas in Wales’, discuss the word ‘evoke’. It’s not a word we use a lot in school, but it’s one students will understand. How can words on a page evoke something? What are the sights, smells and sounds that bring Christmases past flooding back for them? Your students’ challenge is to evoke Christmas. They should produce a piece of writing that is so descriptive it’s poetic. Something that will make the senses of whoever reads it hum. If you want to email/tweet any examples, we’ll happily find a home for the best on this page and share links to any work on your class blog. We’re not normally romanticizers of Christmas — there’s more to it than that — but sometimes a book just clicks. Earlier this year, as part of an ‘Art Across The City’ project, a huge slogan was painted across the end wall of a building in our city. The sea is only the other side of the main road. It’s probably less than a mile from where Dylan Thomas grew up. The project is long-finished. The artwork is still there and will still be there looking down on Christmas shoppers as they hurry back to their cars, too busy to read it. How do you fancy a regular splash of sparkiness delivered to your inbox? Our Sparky News emails feature inspirational videos, lively ideas, our latest offers and cool stuff we've spotted. Are you sparky enough to sign up? 365 Things To Make You Go "Hmmm..."
I Wonder What’s It’s Like To Be Dyslexic? Sparky Teaching was founded in 2008 and exists to inspire and build confidence in young people. By producing creative resources with a twist, we aim to reinforce the big stuff whilst keeping sparky. We like to think we're out to reset your students' test/life balance.